Based in Cleveleys in Lancashire, EasierThan Business Software offer business software support and development services at a price and complexity to suit your company's needs. With over 25 years experience in software development, we have satisfied clients throughout Blackpool, Preston, Lancaster and surrounding areas. Bespoke Database Solutions - Tailored software development to exactly match the requirements of your business. 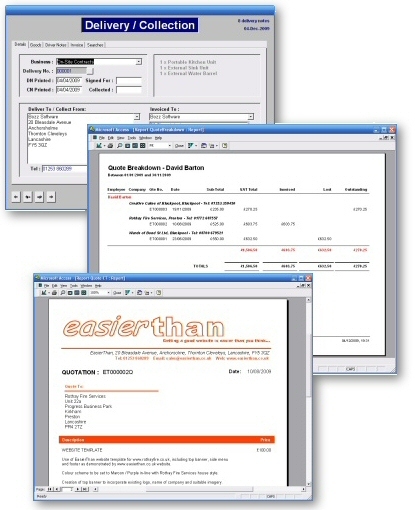 Quotations and Invoicing Software - Easily produce, track and report on professional looking quotations and invoices. MS Access Database Support - Addition, amendments and repairs to existing third party Microsoft Access databases. Upgrading Access Databases - Conversion of legacy Access databases to work with the latest versions of Office and Windows. MS Word, Excel and Outlook Support - Installation, set-up and support of MS Office products, including templates and mail merges. Microsoft Office Training - Ad-hoc or specific training in the use of Excel, Word, Powerpoint, Access and Outlook. Software Support - Advice, installation, set-up and troubleshooting of Windows compatible and business specific third party software. Data Extraction and Migration - Export and import of data for the purposes of migrating systems, archiving and reporting. If you have a software requirement that is not covered within the above pages of our website, please Contact Us with details. More and more businesses are using computers for their day to day running. Done properly, business software can save you time and money.